You are Viewing an Archived Article If you are looking for the latest news or information, please use the navigation on the top of your page or the links to your left. Many people have been asking about Denver Police’s Air1 helicopter over Arvada on December 22, 2017. Officers in the area of 64th & Indiana were looking for a stolen car. An Arvada Officer spotted the vehicle, occupied by a male and female suspect, in a nearby parking lot. The car quickly sped off, driving over several medians, and was tracked by Air1. The male driver, later identified as David Luna of Security, CO, abandoned the vehicle near 57th & Secrest and ran into a nearby field. 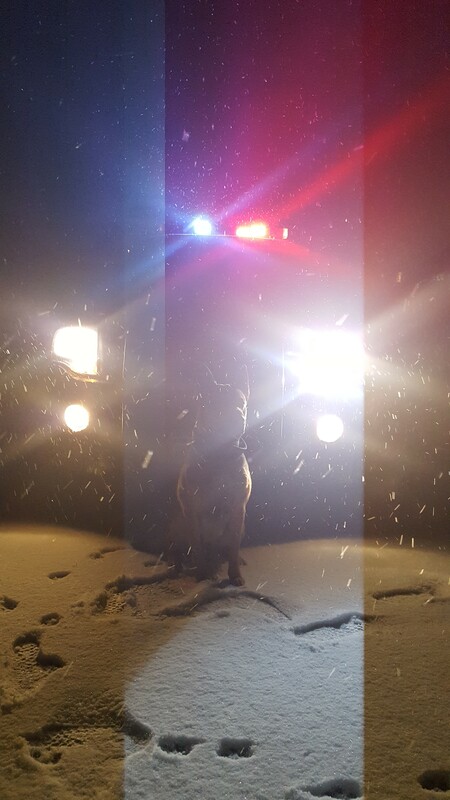 Arvada Officer Berns and his K9 Jax arrived to assist in looking for Luna. After an extensive search, Jax located the suspect hiding in the creek. Once secured and identified, Luna was found to be wanted on a Colorado Department of Corrections parole violation warrant. He was on parole after being charged in 2002 with two counts of attempted murder of a peace officer and escape. In fact, he was added to the most wanted fugitive list in the Pikes Peak region just last week. The female suspect was taken into custody without incident. We want to thank our law enforcement partners at Wheat Ridge PD and Denver Police for their assistance in apprehending Luna.